What is your favorite Christmas story? When the winter comes, the evenings become longer and upcoming holiday brings you many expectations, thoughts and wishes for forgiveness I take a book and while it is snowing outside prefer to stay in a cozy arm-chair. Usually it’s A Christmas Carol by Charles Dickens – a touching story of regret and redemption. Last year Robert Zemeckis has presented a film adaptation of the story, known as Disney's A Christmas Carol. And this year a game by Gogii based on the same theme has been issued right before the Christmas Eve. Though the plot is already 167 years old it reveals the still burning issues of the day. And thanks to the imagination of the game developers of Twisted: A Haunted Carol we may enjoy the unexpected twists of the well-known story. Have you ever wondered what if Ebenezer Scrooge has never repented and regretted? Do you really believe that people’s deeds shouldn’t be judged on the earth? This time the story is told by Jacob Marley, Scrooge's business partner, who was actually murdered by Ebenezer. You’re to travel to the future and to the past in order to gather the evidences of Scrooge's misdeeds and actually to get revenge on the old miser and murderer. The graphics of the game are fabulous and it slightly reminds the film of Zemeckis. The Victorian London covered with the snow creates a specific Christmas mood. While investigating the crime you’ll do your time-travel, meeting the various ghosts of Christmas (Past, Present, and Future). And if in the film by Zemeckis the ghost of the future’s face cannot be seen (as the future due to Dickens is not yet defined), in the game you’ll meet a scary ghost that frightened me. And this was rather reasonable, as your hero Marley was murdered and the future of the people who depend on Scrooge is not bright. Musical background seems a bit muted, sometimes cutting out altogether. The game lacks some voice acting, that’s for sure. But this is not a serious shortcoming, I think. 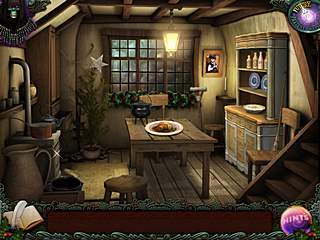 Twisted: A Haunted Carol is and adventure and hidden object game. 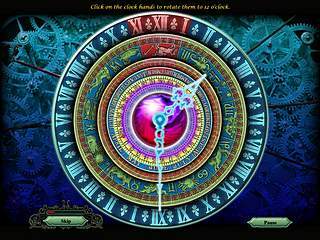 There are several puzzles, mainly connected with the clocks. But to tell the truth I didn’t catch the way they worked out. Everything I did was so tentative, that if I were asked to explain how to manage the puzzles, hardly I could do that. Fortunately the puzzles are skippable. And you don’t have to wait long in order to get that opportunity. By the way the hint button is also recharging pretty quickly. The game is rather standard in terms of things you have to deal with. Most of the time you roam about the locations (there are about 45 of them in the whole game altogether) and pick up different objects which you’ll have to use somewhere else. From time to time you find the parts of the objects needed and have to join them first. Some of the items are found through the HOG-scenes. 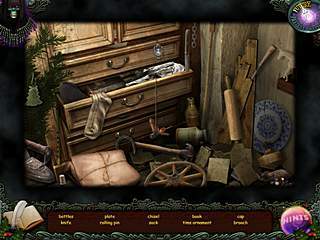 In all the hidden objects scenes you’re given a list of the items needed. Be sure, there won’t be any tiny objects or anything hidden inside/behind of something else. There are no time limits and even the punishment foe the random clicking doesn’t seem to be really strict: your cursor is not under your control for a small period of time. Personally I didn’t notice that at the very beginning. Sometimes you’ll be asked to recognize pretty unusual things such as frozen rat. But every time you point the right object the snowflakes will appear. In general, it's all in the timing. Twisted: A Haunted Carol is a perfect game for the Christmas time. Sometimes it seems that Gogii was thinking right the same and couldn’t afford any extra time to polish the game. As a result we have a nice but rather standard and short game with the perfect plot and graphics. This is Twisted: A Haunted Carol review. Download this game here.